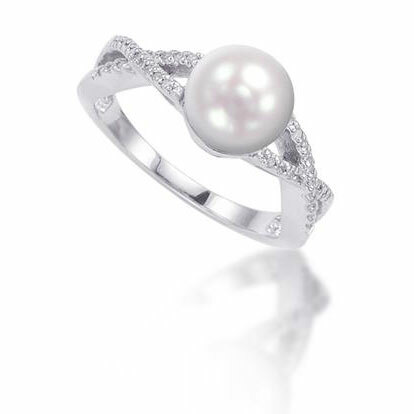 A ravishing and highly classy ring, it is outstanding right from the swirl shape which looks sculpted to the freshwater pearl and diamonds with which it is well adorned. It is daintily crafted from premium 925 sterling silver with its lower half, a single flowing curve while its upper half separates into two strands which swirl and join in a sort of infinity shape. Each sterling silver strand is encrusted with 0.09 Carat diamonds and poised at the top of the ring and balanced between two strands is a seductively stunning 8.00mm freshwater pearl. This is a ring of distinct and bespoke grace which simply glistens and glows with its thirty diamonds. We guarantee our Freshwater Pearl and Diamond Swirl Ring in Sterling Silver to be high quality, authentic jewelry, as described above.